In addition, it’s critical to our grantmaking and public policy work that we understand the best pathways to move women from economic self-sufficiency to security. 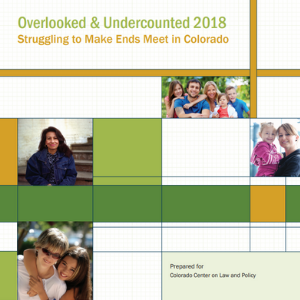 That’s why The M&I Charitable Fund, a donor-advised fund held at The Women’s Foundation, funded Exploring Economic Security Pathways in Colorado, a new report for our state in 2018, that builds upon the Standard. More than one in four Colorado households (430,000 or 27%) lack enough income to cover just the necessities. A significant portion of those living below the Standard work hard as part of the mainstream workforce, but their substantial work effort fails to yield sufficient income. A key structural problem is that women and people of color experience significantly less return on education and work effort than white men. Nearly 9 out of 10 single mothers of color with a young child have income that is inadequate to cover basic needs!